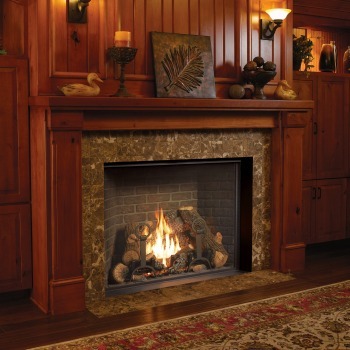 The FPX 4237 Clean Face Gas Burning Fireplace is a large heater-rated unit. This innovative clean face fireplace delivers beauty and powerful performance. The 4237 is perfect for large entertaining areas, from impressive entryways to great rooms; this gas fireplace is a true showstopper that will become an impressive centerpiece in any home. This model truly looks like a real masonry fireplace, with an enormous 1,554 square inch viewing area and fire display that extends down to the floor. The 4237 features a painstakingly detailed 10 piece log set. In addition, the model features accent lighting that beautifully showcases a striking fireplace. This gas fireplace can heat up to a 3,000 square foot area with the help of two 130 CFM fans. Although, when less heat is needed you can also adjust the heat output to a comfortable setting with the GreenSmart™ remote control.